Like the Borscht Belt of the 20th century KUTSHER’S TRIBECA is gone. You’ll need to use your imagination and, perhaps a reference to a bit of Dirty Dancing at this throwback, if in essence name only, to the Catskills of yore. This Kutsher’s was all about up-to-date culinary takes on schmaltzy Jewish classics that had made for a fine Passover holiday dine. The problem is, unless your Russ & Daughters, it’s hard to play the Jewish nostalgia card. Yes, there was the brisket: in this age of pedigree food purveyors it made sense that it was from Creekstone Farms and atop a mound of kasha laced with “veal bacon” partnered with creamed spinach. Wild halibut and a parsley vinaigrette made for a rather aristocratic version of the otherwise proletariat gefilte fish – to all this my grandmother would give one big yummy “Oy!” While all the haute-ness was spot-on, when it comes to a holiday dinner I also yearn for tradition, something redolent of my mother’s kitchen. 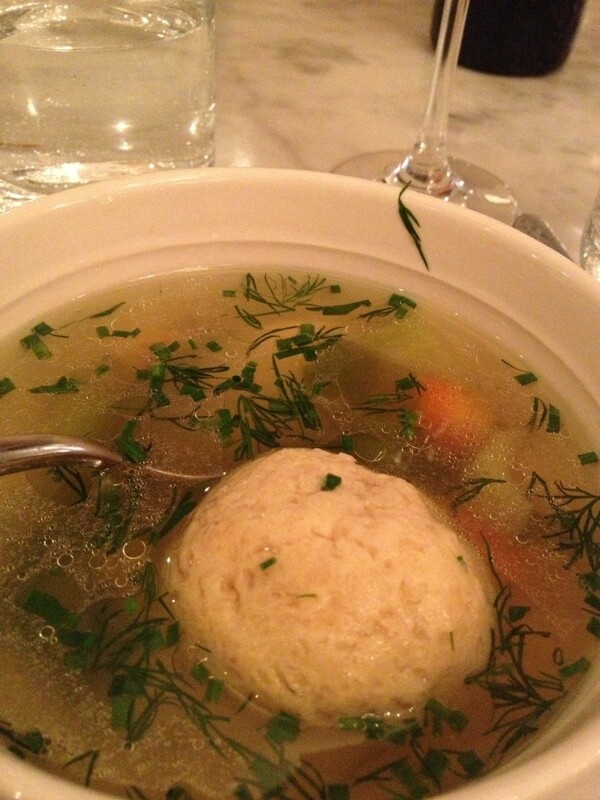 And so, I was glad for Mrs. K’s Matzo Ball Soup at KUTSHER’S TRIBECA. It was a simple consommé with carrots, celery chives and dill had just enough chicken fat floating on the surface to give it home-cooked body – this was not soup as gastro-science project which was a good thing. And, importantly, the matzoh ball was soft and delectable though, in full disclosure, there were years when my mother’s kneydlekh (Yiddush for matzoh balls) resembled hard misshapen orbs – so it goes in any kitchen, especially when you’re serving a small army of diners, and I’d enjoy them just the same. For me, my mother’s matzoh ball soup could do no wrong. So it was with some solace that Mrs. K’s Matzo Ball Soup was good enough to ease me through the pain of another Passover without my mother and, if ever so slightly, content me with memories of holidays and the matzoh ball soup she had served year after year after year. We had a ball at KUTSHER’S TRIBECA.